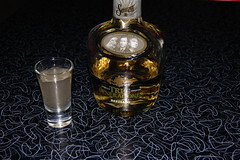 Up this week is a Reposado tequila by Sauza called Tres Generaciones. What a delight this was. $32 USD and well worth every penny. Very smooth, slight oak flavor with hints of pear and vanilla. Wonderful finish that gives a warm fuzzy feeling. Normally I run from big name barands with huge marketing budgets but this one is good. 100% Agave and a beautiful clear amber color. Two big thumbs up.